Jonas Oliva, Universitat de Lleida. Globalization and climate change are bringing together host and pathogen that lack a co-evolutionary past. Amongst those, pathogens of the genus Phytophthora are responsible of some of the most dramatic outbreaks worldwide. We tested whether functional traits could be used to predict which Phytophthora species would establish in a cold environment such as Sweden. Also, we studied whether naïve host populations will adapt or not to a new pathogen. For that, we focussed on Alnus glutinosa stands invaded by P. alni. Resistant structures was a key functional trait to predict establishment in Sweden. Once established, we saw that invasive Phytophthora species distributed in Sweden following a climatic gradient. Temperature was the main driver for aquatic Phytophthora species, while precipitation was the main driver for terrestrial species. We saw signs of natural selection in invaded alder stands. Our work encourages the use of functional traits for predicting establishment and impact of invasive pathogens. It highlights the importance of considering the physical environment (water or soil) where pathogens complete their life cycle when predicting their response to climate. Concerning adaptation, it seems that the amount of initial genetic resistance in naïve hosts could be used to predict natural selection. 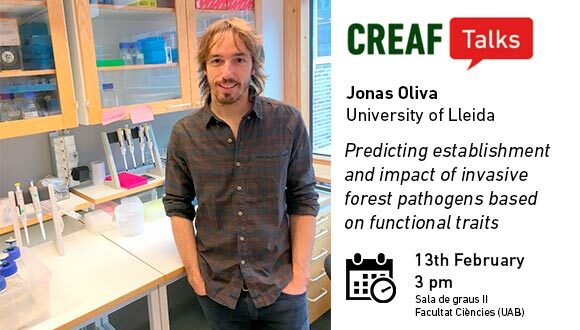 Jonàs Oliva is a “Ramón y Cajal” researcher at the University of Lleida mainly focusing on forest pathology and microbial ecology. He is interested in invasive forest pathogens and the use of functional traits to predict community assembly. He is currently working on the role of microbes in structuring plant communities through plant-soil feedbacks. Other projects include the study of pathogens in drought-induced tree mortality and in maternal effects, as well as understanding the drivers of pathogen emergence in connection with global change. In his lab, they use high-throughput molecular methods such as metabarcoding or RNAseq to study microbial communities as well as the interaction with tree hosts. Their research combines the use of large scale studies involving the use of spore traps or water filters, and experimental setups such as home-away experiments or pathogen-specific infection systems.